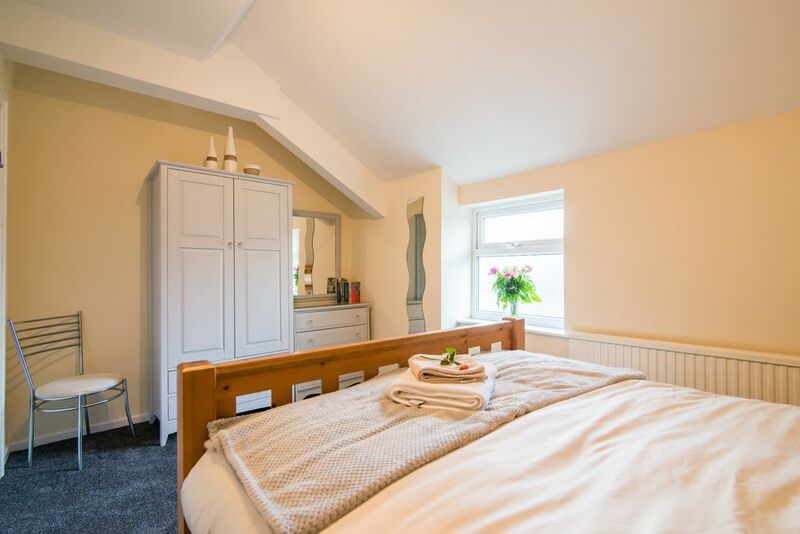 Light, airy and peaceful serviced Apartment close to the Resturants, bars and independent shops of Higher Buxton. A stones throw from the local tourist attractions of the Victorian Pavilion Gardens, Opera House and Poole’s Cavern. Tastefully refurbished and newly carpeted contemporary Apartment has all that you need for a restful and enjoyable stay. New carpet on stairs and living room. Bosch washing machine, new TV, fully Health and Safety compliant. Relax and enjoy. The master bedroom has a King sized bed with new memory foam mattress and shabby chic furniture. The further bedroom has a double bed with cot if required. The bathroom has a shower and relaxing bath. The lounge and dinning area are light and peaceful with breakfast bar, dinning table, two sofas, WiFi, TV, Digital Radio and DVD player with DVD’s. Range of books fiction and walking. The Apartment features Art by local Artists and highlights local attractions. There are a range of books, including fiction and local walks and DVD’s. Bed linen and towels are included. Buxton is a tourist town there is a wealth of activities to enjoy in the local area. The beautiful Peak District National Park is on your doorstep. This appeals to walkers, climbers, cavers and cyclists. It has easy access to popular routes including the Tissington Trail and Goyt Valley. It is close to the stately homes of Chatsworth House (the set for Pride and Predudice), Keddleston Hall, Lyme Park and Haddon Hall. For centuries holiday makers have visited Buxton to take the waters and in last 30 years it has become an Arts hub with the Opera House, Pavilion Arts Centre, Green Man Gallery and Museum. Buxton plays host to a vibrant arts scene with the 3rd largest Fringe Festival in the UK, Opera, Literature Festivals and a range of local art galleries. Most of the local pubs and bars have live music. There are excellent transport links with the Train Station a ten minute walk away and the Market Place where buses can be accessed just four minutes away. The first time I visited this property I was struck by how quiet and peaceful it is. The living area is perfect as a holiday let. Light, airey and spacious. It’s quiet and yet close to local amenities. I then came up with Holiday Hideway the name for the project as you can dip in and out of all the activities Buxton has to offer. When I took this property on it was tired in Estate Agents speak it was tired. I spent February and March putting my heart and sole into creating a place to be. All my properties are too a high standard. If you spot anything that can be improved then please let me know and i’ll consider your ideas. As I mentioned I like that the property is central and yet quiet. New Bosch washing machine, there is washing liquid and washing can be dried on the radiators. Trinity Place, Sherwood Avenue and sometimes across the road in front of St Anne’s Cottage. There are public car parks nearby. Buxton was covered in snow and the apartment felt like a little haven. We had a great short break in lovely Buxton. The apartment was modern, clean and very welcoming. Really close to all the brilliant things to see and do in the town and beautiful surrounding areas of the Peak District. Had a fantastic stay. The apartment was in a great location and was really clean and comfortable. Everything we needed for a relaxing weekend . We would definitely go back again. I had pretty simple needs but this property was excellent for what I wanted. Very comfortable. I only used the master bedroom and didn’t use much in the way of the cooking/washing facilities. WiFi worked well. I parked the car on nearby Spencer Road no problem. The property is also in an excellent location for exploring the area plus right on the doorstep of plenty of pubs and restaurants. Kev responded to my questions promptly and I would definitely recommend this property. My wife, 2.5yo daughter and I enjoyed a lovely long weekend in the Hideaway the first weekend of September 2018. The apartment is ideally located; it's possible to explore on foot from the front door everything Buxton has to offer. It was our first visit to this lovely town. Kevin was also an attentive and considerate host, helping us to check in an hour early and providing all necessary information. Were we to return to Buxton, the Hideaway would be the first availability we'd check. Compact, comfortable and homely, great location to walk to Poole's Cavern and Pavilion Gardens on foot. Shan was great at communicating with me and took great care of the Apartment. I’m glad that she enjoyed her stay.